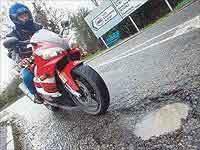 Guidelines for claiming from the council after a pothole crash have been released by the AA. The motoring group issued the advice as it warned freezing weather had left roads so damaged they were 'teetering on collapse'. The Association said in a statement: 'Although potholes are inevitable after severe weather, the UK teeters on local road collapse from a maintenance backlog that was already going to cost £1 billion and take 11 years to put straight - before this winter. 'Local authorities have blitzed potholes by filling them as they appear in recent years - 853,614 potholes were filled-in last year at an average cost of £69 each. 1. Remember, Highway Authorities have a statutory defence as they cannot be held liable for defects they do not know about and have not picked up in regular checks – they are supposed to keep inspection records. A Highways Authority may be liable if they have not acted after receiving a defect report. 2. If you suffer vehicle or other damage due to a pothole make sure the authorities are notified straight away if the defect is serious. Take a note of key details e.g. place, location of defect, its size shape and depth – ideally take photographs. Get 'witness' details. 3. Report the defect as soon as possible. Many councils have websites and special phone lines to help with this. 4. Get quotes for repair or get repairs done – keep quotes, bills and receipts. 5. Write to the highway authority responsible for that stretch of road with all the details. 6. If your claim is rejected and you feel this is unfair ask to see road inspection reports, and try again to claim. If the damage is very expensive, seek legal advice. 7. Most claims may be below a level worth making an insurance claim.